I’m a dork. I admit it. I love making cookies from a cake mix. I think it appeals to my ornery nature which wants to bend the rules. Even rules that aren’t really rules like turning a box of cake mix into cookies. It also helps that these cookies are tender, filled with chai flavors, and have a little bit of crunch to boot. The trick to cake mix cookies is to have a cup of hot water nearby to dip your cookie scoop or teaspoons into after every few cookies. This dough is pretty sticky, and you’ll find it’s much easier to work with if you rinse off some of that stuck dough and then shake off the water before re-scooping. 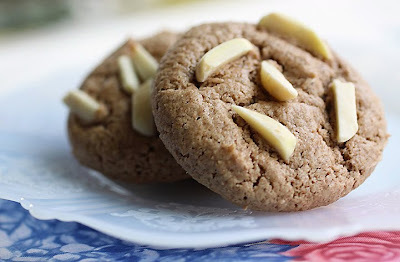 Also, If you like vanilla chai, try substituting a Tablespoon of real vanilla extract for the water to make Vanilla Chai Spice Cookies. 1. Pre-heat the oven to 350 degrees. Position the cookie rack in the middle of the oven and cover two cookie sheets with parchment paper. 2. In a stand mixer, add the melted butter, water, half of the cake mix, eggs, pumpkin pie spice, and ground cardamom and mix until blended and smooth. Add the rest of the cake mix and beat until just combined. 3. Using a mini cookie scoop (or two teaspoons), drop dollops of dough onto the parchment about an inch-and-a-half apart. Sprinkle the tops with a few of the slivered almonds. 4. Bake cookies a sheet at a time for 9 to 12 minutes or until the edges look set and the top looks barely set when touched. Cool for 3 minutes on the cookie sheets and transfer to cooling racks to finish cooling. Recipe adapted from "Cake Mix Cookies" by Camilla V. Saulsbury. Picture by Laura Flowers. I love making cakemix cookies! I've never thought to try this combination though. Looks delicious! These look delicious. I have a cooking contest colleague who has written a book on making cookies from a cake mix. I love this idea--I've long wanted to try them but didn't trust that they would turn out well. I know you only post good stuff so now I have to do it! this sounds wonderful. I love your amazing ideas! I think these sound wonderful!! Chai flavored..mmmmm.. Yum!! I love chai!! I also love making cookies from cake mix! I must admit... the vanilla chai version sounds tempting! YUMMMM I love love love Chai, must try this soon! This is super cool! Totally in love with the cake-cookie idea! I almost did it the other day, and couldn't find any good-looking recipes for it so I made the rainbow cake instead. Wish I'd seen these, because they look delicious!